Meet Our Coronado Ey Doctors! Eye care professionals specialize in understanding how the human eye really works, as well as diseases and conditions that affect your vision - many of which do not have obvious symptoms. Our dedicated team of staff and doctors are available to assist you with all of your eyecare needs. Eye doctors know how age and risk factors affect vision over time for young and old, and they understand the benefits and features of corrective lenses including eyeglasses and contacts. 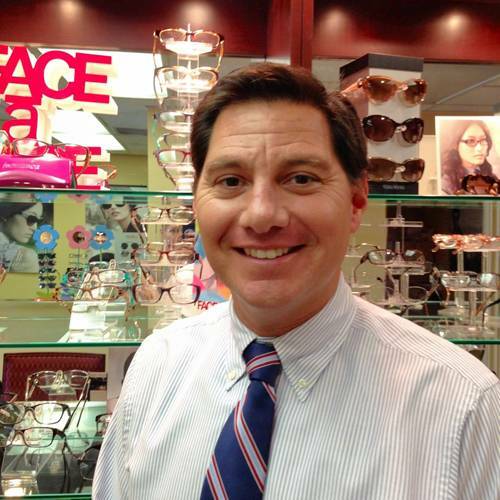 Dr. Moffett is an Optometrist in Coronado providing complete eye care services for the surrounding communities. As a licensed optometrist, Dr. Moffett provides exams, diagnoses, and treatments of all disorders that affect the eye or vision. In addition to training in eye diseases and disorders, Dr. Moffett is also trained in anatomy, biochemistry, and physiology. With this background, Dr. Moffett is trained to recognize a range of health issues; such as glaucoma, macular degeneration, diabetes, and hypertension. Dr. Moffett works hard to stay current on the latest advances in eye health and vision care and regularly attends continuing education seminars and advanced training courses. It is because of Dr. Moffett’s dedication to continuing education that our Coronado patients receive the most modern and progressive vision care available. We are pleased to have Dr. Paul Lavin associated with our office. After Dr Lavin attended UCLA and Pacific University Optometry College, he practiced in South San Diego for 30 years. He says he enjoys working with our practice because of our state-of-the-art instrumentation and quality staff. He particularly enjoys fitting bifocal and other specialty contact lenses. Dr Lavin is able to perform eye exams in Spanish and English and takes pride in providing personalized professional eyecare. Dr. Liu looks back to his youth, when he was aged 10, and had just shot an arrow into his sister’s eye. He now realizes that his epiphany to become an OD wasn’t from that incident, but many years later when he had a chance to shadow some ODs in college and enjoyed the time. Dr. Liu proceeded to UCSD in San Diego and received his BS in Biological Science. Then, after working in an HIV research lab for one year, he took leave of California and headed to New York, where he received his OD at the State University Optometry school in Manhattan. Dr. Liu has been practicing since late 1999. His practice has always been a family affair, from children to the elderly. Dr. Liu performs sports vision consultations, lasik and cataract consults, and hard to fit contacts. Dr. Liu strives to provide his patients the best possible eyecare with a compassionate approach, and helps clients accomplish their desired goals. Dr. Liu supports the military and goes out of his way to thank them for their sacrifices by donating to events that support the military and their families. When not helping people see better, Dr. Liu spends time with his wife and three kids cycling, skiing, and spending time with the family at home and on the soccer field. Dr. Kohler received his undergraduate training at Northwestern University and his Optometric training and degree from Illinois College of Optometry. Upon graduation, he served his military commitment as a Captain in the United States Air Force and was appointed Chief of the Ellsworh Air Force Base Eye Clinic in Rapid City, South Dakota. Dr. Kohler served for eleven years as Director of Clinical Services and research for Continuous Curve / Hydrocurve Contact Lenses in San Diego California. He was the co-designer and developer of the first F.D.A. approved lath cut ultra thin soft contact lens, toric soft contact lens, extended wear soft lens, and soft multifocal contact lens in the United States. Dr. Kohler has lectured, consulted, and published articles on various aspects of soft and rigid contact lens design and fitting. Dr. Kohler has now practiced in Coronado for over 25 years. He is a member of the American and California Optometric Associations, and a Fellow in the American Academy of Optometry. He also co-manages refractive and cataract surgeries and his practice is affiliated with leading laser and eye surgery centers.